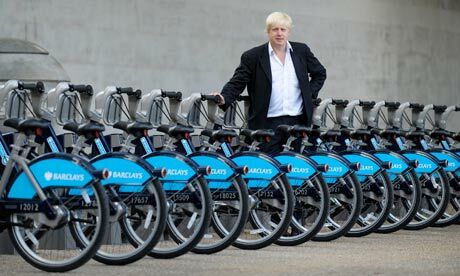 Can Boris Johnson do for schools what’s he done for bikes? The London Mayor, Boris Johnson, was playing high politics in The Guardian today when he blamed the poor performance of London schools for the summer’s riots. It’s complete nonsense — and he knows it: he barely mustered a credible argument and was totally unable to show that schools are to blame for the civil disorder when 75% of rioters were above 18 and most rioters were from socially deprived backgrounds. There’s a stronger argument in blaming the hot weather. But he did say something more much more interesting in the interview: that he wants to gain a strategic role in running London schools as mayor. Now there’s an idea! Many commentators, including all of the founders of the LSN, have been calling for a much stronger “middle tier” to manage, supervise and hold accountable all the independent state schools that are now emerging. The chief inspector, Sir Michael Wilshaw, is possibly the most prominent voice on the “right” to call for this, but now Boris has waded in by asking to establish this strategic overview for London schools. It makes sense, I think, to re-establish something like the old Inner London Education Authority (ILEA), which has the funds and scope and know-how, to make sure that standards are maintained in all schools and not just a favoured few. The local education authorities are withering away before our very eyes: in my borough, Tower Hamlets, once the most powerful LA in the land, the education services have been stripped to the bone by the cuts. What you need is an education system which is a bit like Boris’s bikes. The bike scheme he’s set up in inner and now east London where I live, is great because it’s local: you just walk out your door and you pick up a bike. It’s also ‘uniform’: everyone gets the same bike but you can go up and down three gears. And it’s well maintained by a centralised service which makes sure that the bikes at every station are maintained to the same high standard. Isn’t this exactly what one wants from an education system? Every child gets more or less the same curriculum, but has the ability to go up a gear if they want; standards and resources are maintained by a centralised system that makes sure that no one is missing out, and, above all, it’s local. You don’t have to walk miles to get to the nearest school. I know I could stretch the analogy a bit too far, but I do think it gives one a rather good vision of what ALL London’s schools could be if they were managed by a decent centralised but local service. It would also mean that an element of local democracy would return to the school system with the Mayor having to promote an education manifesto which pleased the vast majority of parents and not just a select few. Are Michael Gove and Cameron listening? Previous Previous post: Thomas Hardy is not boring – he’s brilliant!